Thanks to Art Hamilton, we now know of this area that operated in Colrain during the 1950's. Here are his details and pictures. There was a ski area was at the Lively Farm in Colrain, MA. 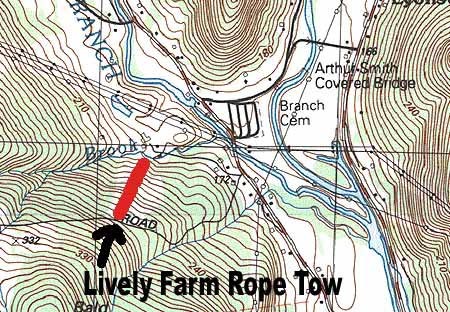 There is a JPEG of the lift tickets, a photo from around 1950 and today’s topo. 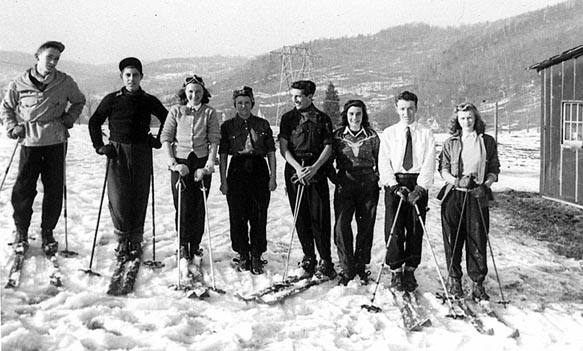 A group of my father’s old ski friends would go to the Lively Farm every Columbus Day for a picnic, and we would climb the old ski tow hill which still had the support poles for the old rope tow standing in the 1960’s when I went there as a kid. I believe the poles were by then supporting 300 ohm twin line VHF TV antenna wire up the hill to a TV antenna far above the farmhouse in the valley below. I believe the Lively family still owns the farm, they were very nice people. 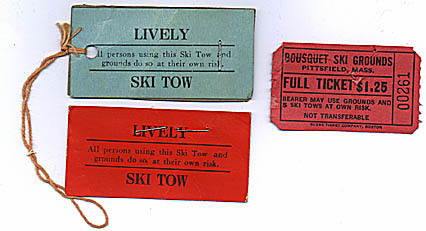 Here is a picture of some tickets for the area, as well as one from Bousquet. Skiers enjoying the hill, c1950. A topo map of the area today.